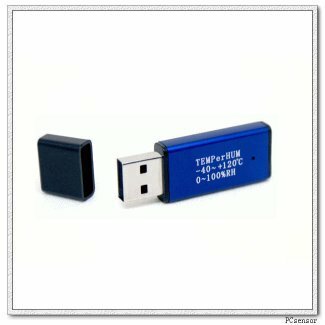 For those of you who want to use 1-3 USB TEMPer HID devices (from PCSensor) here you have ThermoHID. The software is written in Delphi6 - so there is no need for any .NET framework here. I couldn't find any programs out there, with the features I wanted, so I made my own. 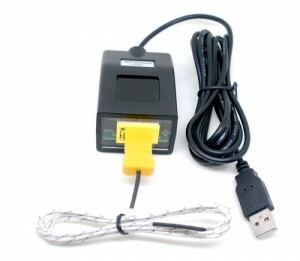 These devices do not have any internal power, and therefore cannot work if they are not connected via a USB port. If anyone still wants me to incorporate this device then let me know as I now know how to drive it. The manufacturers seem to change the internal workings of the device (and therefore how to talk to it) from time to time. Unfortunately, they keep the same case, so it is sometimes impossible to tell which generation of device you have. The newer devices have Vx.x at the end of the name to try and help distinguish them. 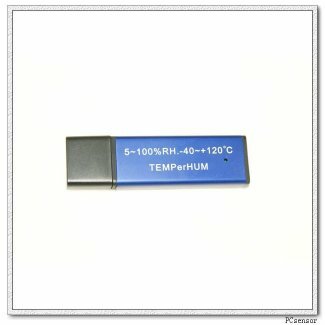 To send the temperature's data to URL, to add to a database, etc. Alarms can be inhibited at certain times of the day/night. The alarm can be set for deviation from the current value of a function. E.g. average of device1. I haven't had time to write a manual for it. Until then, you have the tooltip help sprinkled throughout the program. If you have any difficulty working things out, then let me know, because it probably means that it needs to be put in the manual. New version supporting up to eight of any TEMPer device. Added: Can now use *new* Weather Underground API for Internet Weather. The older WUI Internet Temperature is currently still usable but may become obsolete (deprecated) at any time. 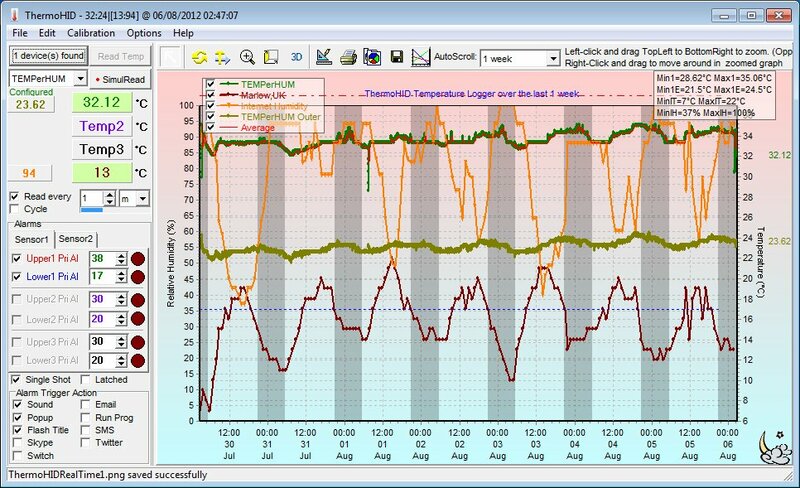 Fixed: Bug in TEMPer2F1.1 raw data conversion routine when temperature was just below zero degrees C.
Added: [CurrentIconInternetTemperature] to FTP commands to display the current Internet weather icon. Fixed: (Hopefully) Occasional occurence of 'List Index out of bounds' when using External file import. Fixed: (Hopefully) Problems with Twitter Authentication now Twitter uses mandatory gzip compression. 6) From the dropdown box, choose all of your other Series in turn and uncheck 'Visible' for each one. This will turn off all the labels that you can add to each point. 7) Press 'Close' button to see the results of what you have done. File->Save Chart Settings and naming the file as 'default.tee'. This will ensure that these settings are loaded in next time the program is run. If you want to use labels then just make 'Marks' visible for just the graph (series) that you want to label. Press the 'Title' button and rename the series as required. Click the 'Source Series' tab, and choose the graph(s) to use from the 'Available:' list. When you have selected the ones you want,then press '>' to move it/them to the 'Selected' list. In the 'Options' tab choose the required options e.g. calculate Exp.Mov.Avrg. every 10 points. Click the 'Close' button when you have finished. Using the 'SimulRead' button (Simultaneous Read) makes the program unresponsive for the duration of the measurement time. Any email Settings using Verizon, do not work. 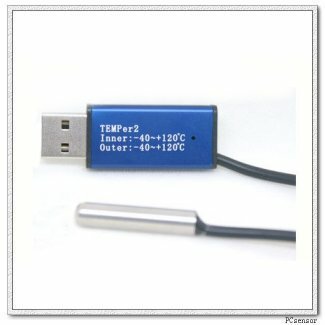 Only one new type TEMPerV1.2, TEMPer2V1.1, TEMPer1K2 or TEMPerHUMV1.0 can be used. 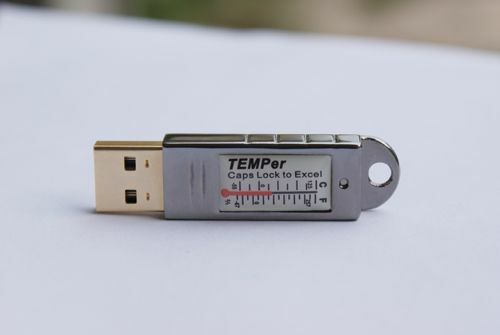 The 'Read Temp' button does not work with the new type TEMPerV1.2, TEMPer2V1.1, TEMPer1K2 and TEMPerHUMV1.0 devices (Use 'SimulRead' instead). 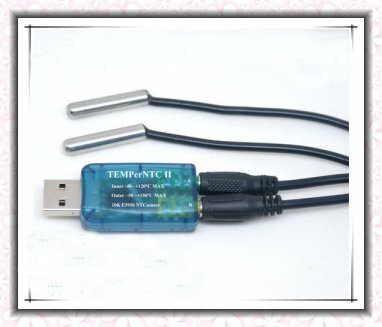 The new type TEMPerV1.2, TEMPer2V1.1, TEMPer1K2 and TEMPerHUMV1.0 devices and older devices cannot be mixed. Some of these problems are being addressed in a new program designed to handle a mix of up to eight of all the newer type devices. 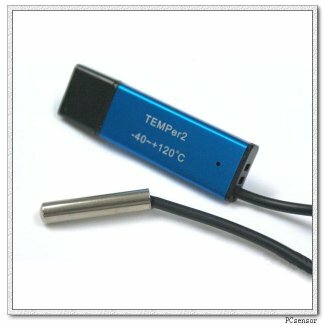 This program is not a modification of ThermoHID but designed from the ground up to cope with the new TEMPerNTC which has one internal and two external sensors per device. I am just conducting some more testing and then I will make it available here very soon. If you have any features that you would like to see incorporated then please let me know. You can change the names of the devices by pressing Options->Chart->Edit, and then hilighting the device that you want to rename and clicking the 'Title...' button. You may need to switch on the countdown message for Firefox and MSIE7, if you want to update it in the Status Bar of the client's Web Browser. (For instructions see the web page source in the client's Web Browser). 'Send to URL' currently sends to the URL: 'device' (1,2 or 3), 'sensor' (t or h), 'temp' (the temperature or relative humidity) and 'type' (C, F or %). Click and drag on the Alarm display area, to break it off and reposition it, if the screen resolution is small. If you have proxy issues, then you can try and uncheck Help->'Use Indy for Internet'. (It uses the MSIE internet settings i.e. WinInet). Relative Alarms will only work once per trigger (They currently don't use 'Single Shot' nor 'Latch' checkbox). The small red dot next to each temperature/humidity display, denotes that it is 'calibrated'. (The hint shows by how much). If a chart (*.tee file) is found called 'default.tee', it will be loaded on the program 'startup'. If you would like to view or edit chart (*.tee) files then you can use TeeChart Office. Please only delete series that YOU create. The program will crash if you try to delete the series that it came with. In the section called 'Real Time Images' you will see an image for each device that you have connected. Right-click on the image to change the settings (Font color, background coloe etc.) to whatever you like. In the 'Auto-refresh' box enter the number of milliseconds to refresh the image. Drag the png to where you would like it and press 'OK'. They have a faster measurement time. Approximately 4 readings per second can be achieved compared with 1 reading every 2 to 3 seconds for the older devices. It is definitely the device that is sometimes reporting incorrect readings (flat spots) and not my software. I have come to call the problem 'stickiness' as the devices appear to 'stick' at a certain temperature until the actual temperature moves away sufficiently from the 'sticky' temperature. The 'stickiness' seems repeatable for a given device although the temperatures at which it may occur (and there may be several for each device) seem to change depending on each individual device. If you are lucky, some devices don't seem to suffer from it at all. It is most apparent if the temperature is rising/falling very slowly over time. So, when you get to know your device, I think you can trust it except at its 'sticky' temperatures at which, all you can say, is that the real temperature is somewhere 'around' the flat spot. I have now (over the years) collected about 10 or 12 of these devices of varying sorts TEMPer, TEMPer1 TEMPer2, TEMPerHUM etc. and even the most recent ones still suffer from it. I personally have not got in touch with the Chinese manufacturer about it but I know of several people who have. As far as I can tell, they have not provided a satisfactory answer or fixed it (mostly they have provided no answer). 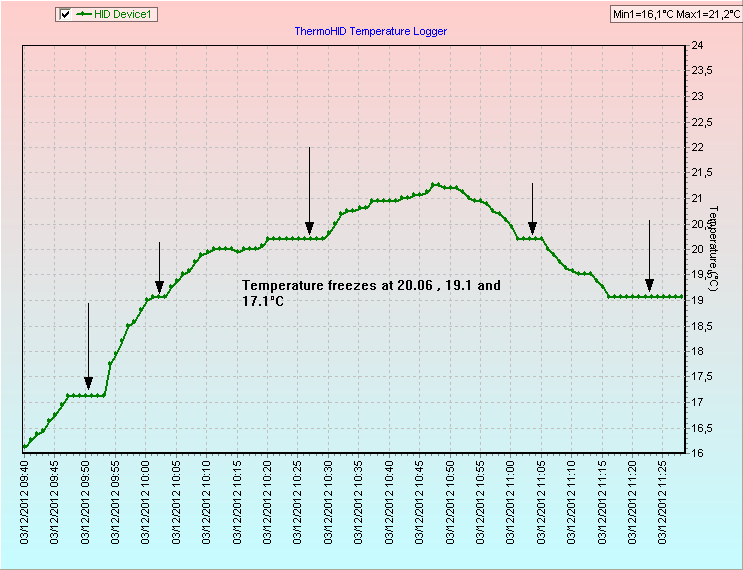 Example of 'stickiness' of TEMPer1 using TemperV23.5 software from the manufacturer's website (PCSensor). There are no configuration files or 'Setup' routine - it should just work when you plug it in and start the program. 1) Put the 'ThermoHID.exe', 'HidFTDll.dll', 'RDingUSB.dll' and 'SonixUSB.dll' in a folder of your choice. 3) In the Options -> DLL menu option at the top, look to see if 'DLL Loaded' is greyed out and followed by some long number in brackets. 4) Plug in the device. 5) Ensure that the first button (just below the File menu) shows 'No Devices' if there are none plugged in, or it shows '1 device(s) found' if there is one device plugged in, etc. 6) Go to 'Help-> Debug' and look at the middle box at the bottom, which, when you move the mouse over it, pops up a tooltip saying 'HID Devices Found'. Each TEMPerHID device is found twice. (Sensor and LED)'. Ensure this box contains 'PCsensor Temper' or 'TEMPerV1.2' written twice. 7) Select 'Help->Debug' again to turn off the debug windows. 8) Press 'Read Temp' or 'SimulRead' button to read the device. 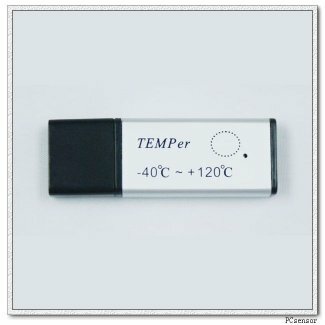 The device should display the temperature where it initially says 'Temp1'. If you are using MS Windows 2000, then 'HID.dll' from WinXP is required. This is provided in the downloaded zip. There is no install/uninstall routine for the program. If necessary, untick it and then tick it again. When you are asked 'Remove Registry Settings?' answer 'Yes'. Ensure that 'Run when Windows Starts' in the Advanced Tab is unchecked. The program can now be closed and the contents of the program folder can be deleted. SomeName.tee -> Saved chart files. View these with TeeChart Office. 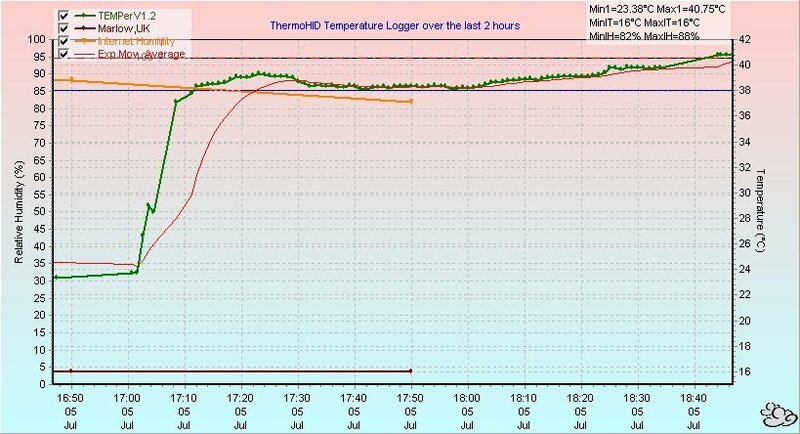 ThermoHIDRealTime.txt -> Single line file containing the most recent measurements to be used for further processing. twitsettings -> Once you have authenticated the program for use with Twitter, the settings are stored here. NTC_10K_1.txt -> This is the calibration file used by older TEMPerNTC device. If it is not found then an internal copy is used. Has anyone tested these devices for accuracy? If anyone has done any tests, I would be pleased to know the results. Results of some accuracy testing on my devices. The "Cal. 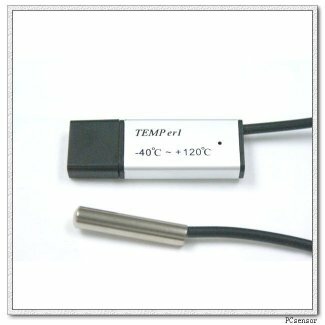 Temp" column holds the temperatures for which you have calibrated the device. If you have calibrated at more temperatures than the two extremes shown by default, you can add rows with 'Edit->Add Row'. The offset columns show the amount by which the read temperature is adjusted, to give the final "calibrated" temperature. The offset at other temperatures, will be interpolated between these cardinal points. Note: Newer devices can hold a single number within a small amount of FLASH within the device itself. This can be used as a 'quick-and-dirty' temperature correction factor if required. Right-click the link and choose "Save Target As...". If you need to go back to a previous version for any reason then please tell me so I am aware of any problems. If you want to use one of the languages below please place the .lng file in the same folder as the program. Then in ThermoHID, go to Options->Settings. Select the 'Language' Tab. Select your desired language. If you find any mistakes in the language (.lng) files please edit them with a Unicode editor ( e.g. BabelPad) and email the new file to me and I will put it on the website. I you are willing and able to translate into any other languages then email me and I will supply the file to translate. In order to use FTP, first make a text file (template) with the HTML code that you would like to present on the destination site. From the table below, place the codes (inside square brackets) that you wish to use into the HTML file at the appropriate places. Save the file and reference it in 'Local Destination' on the FTP tab. 1) ThermoHID will automatically start when Windows starts, even before you log in. 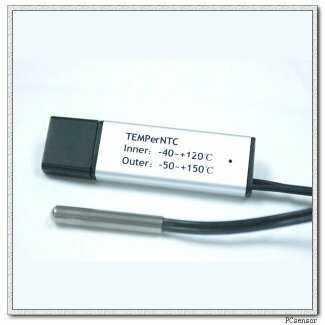 That�s helpful for continuous temperature monitoring, even with power interruptions, automatic system restarts, etc. 2) The running program will be invisible, with no icon in the system tray. Program adjustments are a little more tedious to make since you cannot have the program running both as a service AND running the same EXE from your desktop. Please be aware that, if you are storing the settings in the registry, then the settings will belong to the user that the service is started under. If you only want one set of settings available then please ensure that File->Use ini file for settings is ticked. Screen shot of ThermoHID below.